Austin Locksmithing & Security Inc. is the expert in commercial and residential locks and security, having served Olean, Cattaraugus, Allegany, McKean & Potter counties as well as the entire Southern Tier and Northwestern Pennsylvania for more than 40 years. Trust Austin for your commercial and residential security needs. 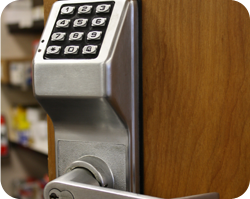 From card access and push button locks to panic bars, crash bar and alarm locks, Austin has you covered. Our certified technicians can complete a master key system installation, while also working with you to identify high security upgrade solutions. Austin ensures that your home is safe - protecting what is most valuable to you...your family. High security lock installation, dead bolts, digital locks as well as lost house key replacement are just a few of the services we offer our residential customers. Austin offers a wide selection of safes - from high security safes to gun safes, home and office safes, commercial, fire and depository safes as well as reconditioned pre-owned safes. Austin also provides a full line of safe service that includes opening, repairing, lock retrofitting and moving your safe.